Grunenwald, Father Nicholas Rouch and Msgr. Edward Lohse. Missing from the photo are Ray Feroz and Msgr. John Herbein. The newly created Venango Region Catholic School has moved forward with plans for the future as it recently appointed its full board of directors. 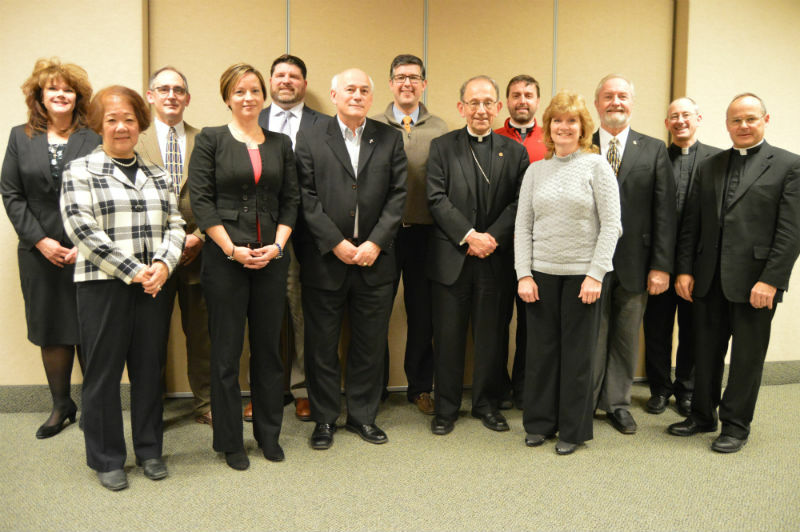 For the first time since its inception, both members of the association and its board of directors met Nov. 20 at St. Mark Catholic Center in Erie. Both the directors and members have worked collaboratively, he said, to find representatives of each school in the Venango Region Catholic School Association: St. Patrick in Franklin, St. Stephen in Oil City, and Venango Catholic High School (VCHS), also in Oil City. Among the association’s board of members are: Bishop Lawrence Persico, chair; Gallagher; Father Nicholas Rouch, vicar for education; Msgr. Edward Lohse, vicar general; Msgr. John Herbein, pastor of St. Patrick Parish, Franklin; Father John Miller, pastor of the partnered Oil City parishes of St. Joseph and St. Stephen; and Greg Merkel, also the chair of the board of directors. At the meeting, three at-large representatives of the board of directors were approved. They are: Dr. Joseph Grunenwald, Michelle McGee Morrison and Robert Puleo. Other directors on the board are Kay Hopwood, Ray Feroz, Deacon Richard O’Polka, Margaret Janidlo and Debra Sobina. Faced with enrollment and financial concerns, the schools came together to strengthen Catholic education in the Oil City/Franklin area of Venango County. The new association used a grant from the Religious Education Endowment Fund to conduct an outside comprehensive study capturing socio-economic, geographic, cultural, attitudinal and historical information and more. According to Merkel, the Nov. 20 meeting was the first chance for the directors and the members to meet each other.